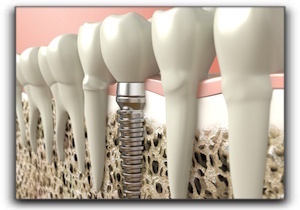 Dental implants are widely regarded as one of the biggest steps forward in dentistry in the last half century. They are available from Vanguard Dental Group in Derry NH. In the past, if a patient had a missing or severely damaged tooth, the only options were dental bridges or dentures. These days, dental implants have proven to be superior to dental bridges. They can also anchor dentures for some patients. Seamless – Fabricated to have the same shape, size and color of the original tooth, the implant will blend seamlessly with all the other teeth. If the original tooth had aesthetic issues, these can generally be fixed with the implant crown. If you want to find out if a dental implant is right for you, call Vanguard Dental Group for more specifics. We also provide pediatric dentistry. Schedule an appointment with us today!